Vic joined the Navy in 1994. At 26, he was the third oldest recruit in his class. 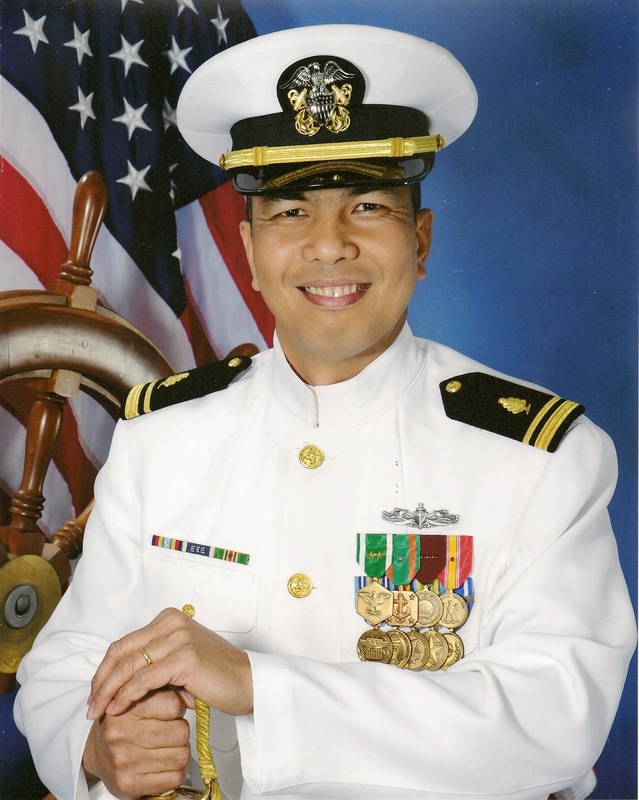 We had both been working for the cable television company on Saipan and they were running into financial difficulties so when we explored our options, Vic ran into the Navy recruiter, and that's how the story began. Vic was an Electrician's Mate and rose to the rank of Chief (E-7 to those of you who are familiar with military ranks). He was an early candidate, making Chief after only 8 years and then he was stuck. It's one of those instances where the senior ranks are top-heavy and with no-one retiring or moving on, chances for advancement were slim. He decided to pursue another avenue, got his Master's degree in Occupational Safety and Health, and applied for a commission. It all seemed to happen so fast and it seems like yesterday when I think about it. Vic was commissioned in January 2012 but was pulling double duty in his new position and in his old one during a major inspection on the ship he had been assigned to since 2010. Finally, the inspection was over, he left the ship, and came back to Rhode Island where Sophia and I had been living so that he could attend Officer Development School. You may have heard of Officer Candidate School, but Officer Development School is for the Staff Corps - doctors, dentists, nurses, chaplains, civil engineers, and industrial hygiene officers (that's Vic). Six weeks of learning how to be an officer culminated in a graduation ceremony with all the pomp and circumstance that the military does so well and here he is above, our graduate. Next up, orders to his first command as an Industrial Hygiene Officer and a new way of life for all of us. Very interesting! I know next to nothing about the military, so Vic's story is fascinating to me. Congrats to him on the advances in his career. That old sales slogan comes to mind, "You've come a long way, baby!" :) Much to be proud of. You guys are quite the globe trekkers! Congratulations!!! Sounds like y'all have had a blessed military career.